(AP) Columbus man Zyderrious Platt was in court Tuesday charged with murdering his wife, Jilani Platt. But before the trial could get started, the victim's brother, in an emotional outburst, attacked the murder suspect. 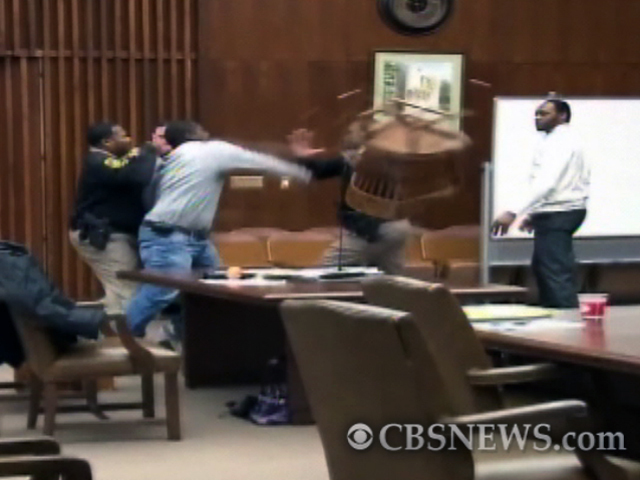 Moments after sheriff's deputies brought Platt into the courtroom, 30-year-old Jeryl Carter, the brother of Jilani Platt, jumped over the barrier, picked up a chair and threw it at the murder suspect. Carter then started swinging and yelling until deputies wrestled him to the ground. Judge Bobby Peters cleared the courtroom, while Jilani's brother was handcuffed and Platt was escorted out. While on the ground, Carter yelled out several times, "He should die! Give him to me...please let me kill him!" Platt, 33, faces several counts of murder and feticide for allegedly shooting Jilani, a 26-year-old mother-to-be, in the head with a Luger handgun. Investigators say the couple got into an argument over rent money that escalated into a scuffle. Platt allegedly told police, he choked her and she fell down a staircase in their Crystal Court apartment. Platt allegedly claims he left and came back home, only to find Jilani at the bottom of the stairs, not moving. According to investigators, at that point, Platt said he panicked, put the body in his Suburban, drove to a remote location and accidentally fired his weapon in the air, a bullet hit Jilani in the head. Detectives say he later led them to the site where her body was found -- a retention pond. Platt also faces charges of aggravated assault, possession of a firearm during the commission of a crime and possession of a firearm by a convicted felon.